Join your colleagues in St. Augustine, Florida April 1-4, 2019 at FHSA 2019 annual conference & expo, "Celebrating 20 Years of Excellence | Advocacy | Leadership in Quality Early Childhood Education and Services. This years' conference will provide high-quality educational sessions for Florida staff and parents! Attendees will be offered a variety of opportunities to engage and become empowered as we will offer in-depth education and focus on a particular subject of interest to Head Start, Early Head Start, Migrant Head Start, and Child Care- Early Head Start Programs. FHSA is offering a conference special by registering five (5) staff you will receive one (1) Parent Registration FREE! To receive this special offer register all your attendees and select the invoice option. Once completed, contact the FHSA office at (850) 694-6477 or [email protected] to reimbursed. On Tuesday, April 2 during our 20th Anniversary celebration, FHSA has arranged two excursions including transportation to take conference attendees into the downtown historic district of St. Augustine to take in sights, learn some history and explore Florida's historic coast. Read more about these excursions below. The choice is yours, but you will need to reserve your space when you register for the conference. 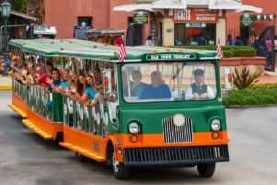 A bus will pick up all attendees choosing to participate in the excursions from the World Golf Village Resort and return all attendees to the hotel after the excursion has concluded. We recommend you to take an opportunity to dine-around either before or after the tour. What to wear and bring along: It is strongly recommended that participants wear cool, comfortable clothing and walking shoes. Participants may also want to bring along sunglasses, and/or an umbrella in case of rain. Our Ghost Tour passes by some of the scariest and most sacred sites including the Huguenot Cemetery, the final resting place of the victims of yellow fever…or was it final? Some visitors to the burial grounds have reported seeing eerie apparitions and translucent orbs floating about. If you keep a watchful eye while passing the City Gates, you might catch a glimpse of Elizabeth, a child victim of yellow fever, waving to passersby. You will also pass the Tolomoto Cemetery. Who’s playing games in the cemetery when the sun goes down? Is it the spirit of five-year-old James jumping from branch to branch in the trees or is it the Ghost Bride, still waiting for her walk down the aisle? Plus, you’ll visit The Old Drug Store, Potter’s Wax Museum, and The Old Jail! Relive the story of the first settlement in North America as you visit Castillo de San Marcos, the Spanish fort built in the 17th century. Visit the world famous spring that Ponce de Leon deemed the Fountain of Youth, where you can actually sample the water. Explore the site of the first Mass in America at the Mission of Nombre de Dios. Experience early St. Augustine as you tour old St. Augustine Village, featuring houses from the 18th and 19th centuries. We make exclusive stops at the Old Jail, St. Augustine History Museum, Potter’s Wax Museum, the Spanish Military Hospital, and the Ximenez-Fatio House.